Tecno L9 plus was launched in April 2017 and it is still among the latest tecno phones in Nigeria. The smartphone features a robust battery capacity of 5000mah and it’s greatly loved for its enormous battery life. What is the difference between tecno L9 plus and tecno L9? When it comes to battery life the L9 plus has a large battery capacity of 5000mah that can last for about 72hours. With the enormous battery life you can watch videos, play games and talk with family & friends. Tecno l9 plus has a sleek & beautiful design. It is flat on the palm and with a light weight of 0.5kg. It has a fingerprint censor at the back. This serves as a security feature for securing the smartphone. 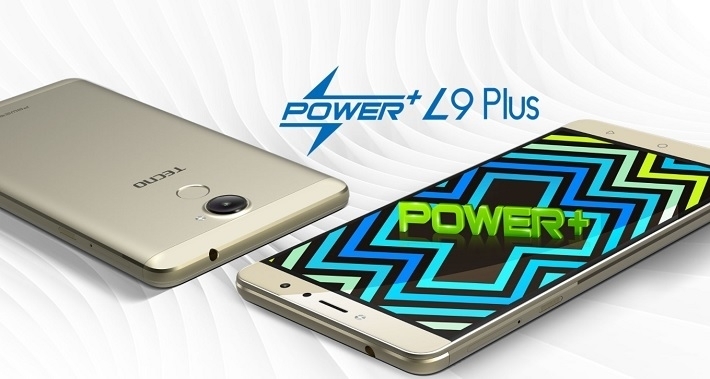 L9 plus is also built with the latest android 7.0 nougat operating system and runs with a powerful 1.3GHz quad-core mediatek processor. It also has a 6.0 inch wide screen that brings your pictures, movies and games to life. Tecno L9 plus was built with speed in mind. This smartphone has a 2GB RAM which is considered to execute multiple applications, games, and movies without a lag in speed. Hence this means that this smartphone won’t slow down when you are playing music, playing games and watching movies at once. For the storage, this phone is equipped with 16Gigabyte storage. but in case if you want to store more, you can back it up with an external SD card. L9 plus is built with a 16MP rear camera and a 5MP front camera. Also the front camera is accompanied by a soft flash and the back with a led flash so you can snap at night. According to recent reviews by users, the cameras are not so bright as other tecno phones like camon cx but its still impressive. When it comes to performance tecno L9 plus is optimised for speed as mentioned earlier. It’s not the type of smartphone that will slow down your life. It doesn’t heat up like most smartphones do. Tecno L9 plus was released after tecno L9 and you might be wondering are the major differences between the two? What make makes L9 plus superior to L9? Tecno L9 plus has a screen size of 6.0 inches while tecno L9 has a 5.5 inch display, And also When it comes to battery capacities L9 plus has 5000mah while L9 has 4000mah. Another notable difference is the RAM, L9 plus has 2GB RAM while L9 has 1GB RAM. There are no much differences between the cameras of both phones except that L9 plus has a rear camera of 13MP while the other has 8MP back camera. Disclaimer: we try our best to make sure the information on this page is accurate. Although as humans we are prone to make mistakes. so therefore if you find any mistakes on this post don’t hesitate to notify us.